At the time of King William's Domesday records, 1086, there is no mention of the town of Cromer. Instead, we read of Shipden, a town that now lies beneath the sea. In medieval times we read of Cromer, alias Shipden. The natural break in the cliffs now known as the Gangway was the centre of the town, with fishermen and merchants plying their trade from the beach below, and sheep farmers keeping their flocks on the hills behind the town. In 1285 the king granted Cromer a Friday market and a yearly fair of eight days. 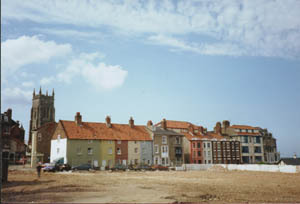 By the 15th century the town was sufficiently prosperous for the large church of St Peter and St Paul to be built, replacing Shipden's lost church of St Peter. In 1565 Cromer is listed as a landing place with a pier, with 117 householders. The merchants traded far afield, and Cromer vessels crossed the North Sea, sailed to the Baltic and even to Iceland and Greenland. The trading vessels of Cromer continued to land on its open beach until almost the end of the 19th century, when the railways offered a more efficient means of transport. Undoubtedly business had declined over the centuries, with the general decline in the importance of the county of Norfolk as a centre for the wool industry. Fishing continued to be a mainstay of the town, with cod, mackerel and other longshore catches providing a year round return, before the decline to the crab and lobster specialisation of today. Tourism began to be of more importance from the beginning of the 19th century, and it is from that period that the first written guide to Cromer dates. The end of the war with France provided the opportunity for this influx of visitors. The Gurney family of Earlham Hall were some of the earliest visitors of this sort to the town. The mixture of sea views and bathing, the woods and walks behind the town and the activity on the beach brought those with leisure time and the time to draw and paint to Cromer, including a number of artists of the Norwich school. The coming of the railways and the accompanying publicity started by the travel writer and theatre critic Clement Scott - who coined the name Poppyland for the area - led to a further rush of visitors in the final decade of the 19th century. Many of those visiting the town chose to stay, contributing to local prosperity and building substantial houses. Others took the opportunity to develop businesses based on the holiday trade. The great hotels, few of which remain, date from this time. With the decline of the town after the medieval period, the church itself had fallen into a considerable state of disrepair. The Reformation and the time of Oliver Cromwell's Commonwealth had also contributed to the deterioration of many church buildings. The church windows had largely been bricked up and the chancel had been demolished. The Reverend Thomas Gill had resorted to the use of gunpowder for this purpose in 1681. The restoration of the church was undertaken in the reign of Queen Victoria, and it was substantially restored for the beginning of the 20th century. Cromer also became known because of its lifeboat station. Today the offshore lifeboat station is at the end of the pier, whilst the inshore lifeboat operates from the beach. In the 19th century, almost every coastal town or village in Norfolk had its lifeboat. In the 1920s motor lifeboats began to take over from the pulling and sailing boats. 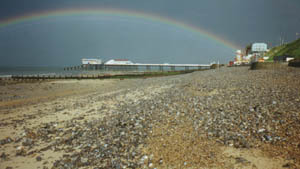 The building of the pier-head station at Cromer meant that the lifeboat could launch in almost any weather, and Cromer took over responsiblity for much of the coastline to the east, and in particular for the Haisboro' Sands. The work of Coxswain Henry Blogg and his crew became known nationally, and has been continued by his successors led by Henry 'Shrimp' Davies, Richard Davies, Billy Davies and today's Coxswain, John Davies. Today Cromer and district remain a very popular spot for visitors. Of course it is not possible to guarantee the sunshine and warmth of overseas destinations, but the summer can offer open beaches, country walks, safe sea bathing and a variety of interesting places to visit. The area now offers a selection of activities, from the local museums, the swimming pool at Sheringham, heritage railway journeys, 'Seaside Special' at the end of the pier - plenty to interest everyone expect perhaps those who want to be absolutely certain that they can lay on the beach all day and dance the night away at night-clubs! SECTLINK('A Dictionary of Cromer and Overstrand History'^Misc#B14889) is a comprehensive coverage of the history of the town. SECTLINK('Cromer - Chronicle of a Watering Place'^Town and Village#B14855) by Martin Warren is an illustrated overview of the town's history. SECTLINK('Cromer Pier'^Albums#B14852) by Christopher Pipe investigates the story of the pier from the 14th century to the present day. SECTLINK('Poppyland in Pictures'^Albums#B14866) by Elizabeth Jones is the illustrated story of Cromer and Sheringham, Overtrand and Sidestrand, from Victorian and Edwardian times. There is a large and growing web site developed to accompany the book 'A Dictionary of Cromer and Overstrand History' which contains a range of primary and secondary sources on the story of the town. 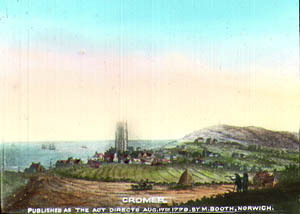 Cromer in a print of 1779. This copy is from the Randall-Salter magic lantern slide collection. The small town is clustered around the church. The open west beach of Cromer, looking towards the pier and the town today. With the land behind the gangway cleared for a while in 1999, the view was open at the top of the gangway, where the settlement first began. What is now a row of cottages was originally built as a granary and later leased to house coastguards. 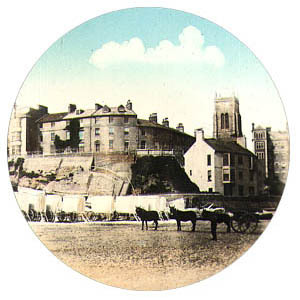 On the right are the house of Brunswick Terrace and the Crescent, built to enjoy the views over the pier and the fishing boats. This photo, from the end of the 19th century, is taken at the foot of the gangway. The donkey carts were used for hauling coal up from the beach, after it had been landed there by trading vessels. The bathing machines in the background indicate the popularity of the town as a select holiday resort at this period. The picture is from the Randall-Salter magic lantern slide collection. Cromer has had regattas and summer carnivals from at least early in the 19th century. Today the Red Arrows have become a fixture for Carnival Day - usually Wednesday of the third week of August. 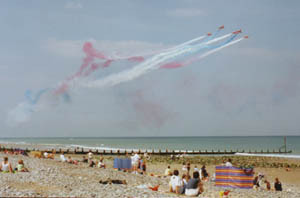 The beach and cliff-tops give an unparalleled view of the display.